Combined with a relative fast f/1.8 maximum aperture and autofocus, this new model is a versatile short-telephoto for general photography, indoor sports in dim lighting, and indoor and outdoor portraiture. Lens construction consists of nine elements in eight groups, with — unusual at this price — a single ED element to reduce color fringing. The lens’s internal focusing system utilizes a double linear autofocus motor which is said to deliver fast, precise, and near-silent focusing down to a minimum 0.8m. It features a nine-bladed circular aperture for rounded specular highlights, a customizable focus-hold button (as seen on some of the company’s high-end G Master lenses), and is dust- and splash-resistant. The lens measures 82mm in length, weighs 371g, and has a 67mm filter-thread. 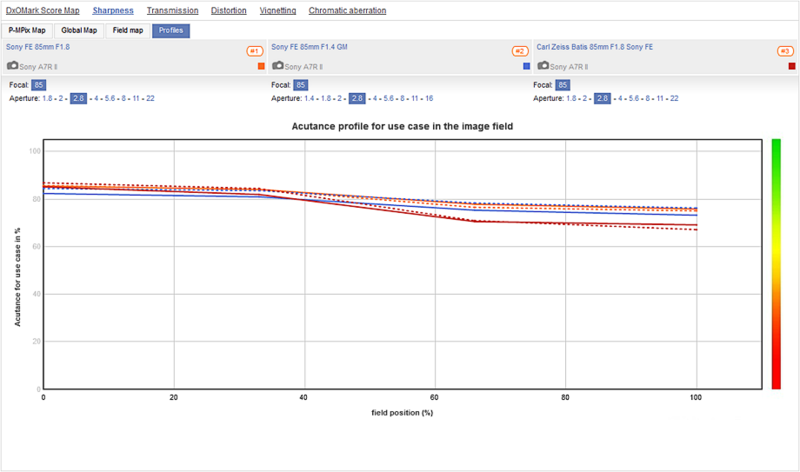 Manufacturers usually reserve the best image quality for their ultra-high speed models, but that’s not the case here. Sony FE 85mm F1.8 performs exceedingly well in our tests. It has a truly impressive 1.8 TStop transmission (matching that of the maximum aperture), and extremely high levels of sharpness, both of which helped it achieve a high DxOMark score, and placing it alongside pricier alternatives such as the rival Zeiss Batis as well as the Sony FE 85mm f1.4 GM. The new Sony is sharp wide-open, with levels in excess of 80% acutance across the central 30% of the field — though as you might expect, sharpness levels drop in the outer field. Peak sharpness is achieved at f/4; however, it achieves optimum performance and more uniform sharpness across the field between f/5.6-8. Distortion at 0.3% is low generally, but slightly higher than you might expect to see in the lab for this focal length. It’s nevertheless a minor issue. 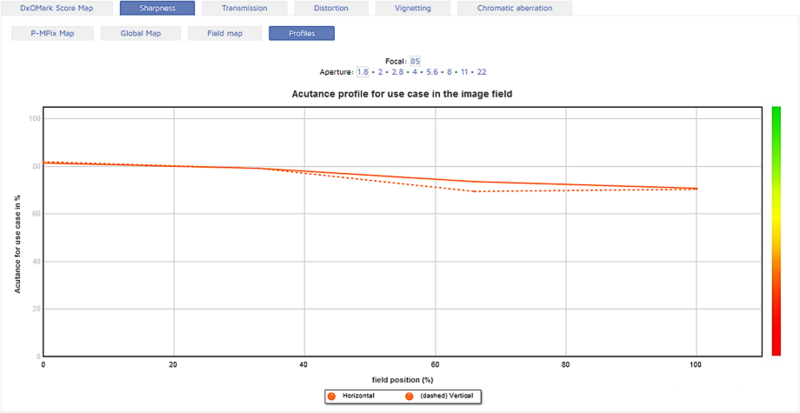 Vignetting is within expected limits, and is lower than some pricier rivals, but it diminishes rapidly from quite a small central core. Even when stopped down, vignetting never quite clears completely, leaving a trace in the corners beyond f/8. 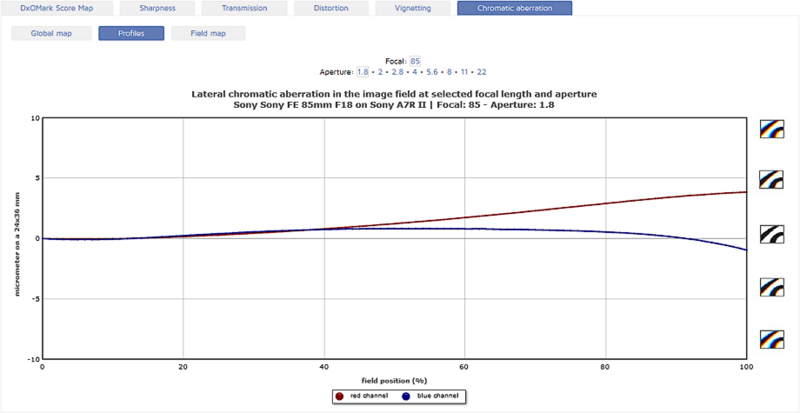 With a measured maximum of 5 microns, lateral chromatic aberration is well-controlled, particularly in the center wide-open, where it’s not always low. In fact, it doesn’t improve on stopping down, but gets slightly worse; overall, however, lateral color is low and shouldn’t be an issue at any setting. In any case, it should be easy to remove via software. Compared to the maker’s own FE 85mm F1.4 GM lens, and the rival Zeiss Batis 85mm F1.8, respectively, the new lens offers similar levels of performance. 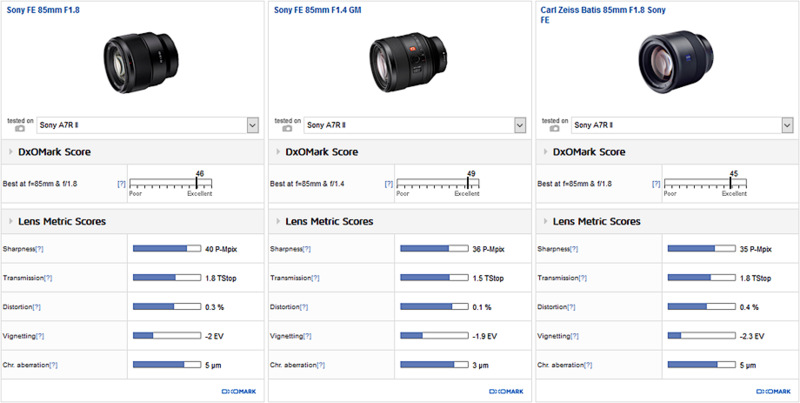 All three perform similarly at f/1.8, with the new Sony displaying high central sharpness along with the expected fall-off in sharpness in the outer zones. While the higher-speed G Master has slight astigmatism that may well add some aesthetic quality to images shot wide-open, it also has the lowest and arguably the least imposing and most attractive vignetting of the trio. 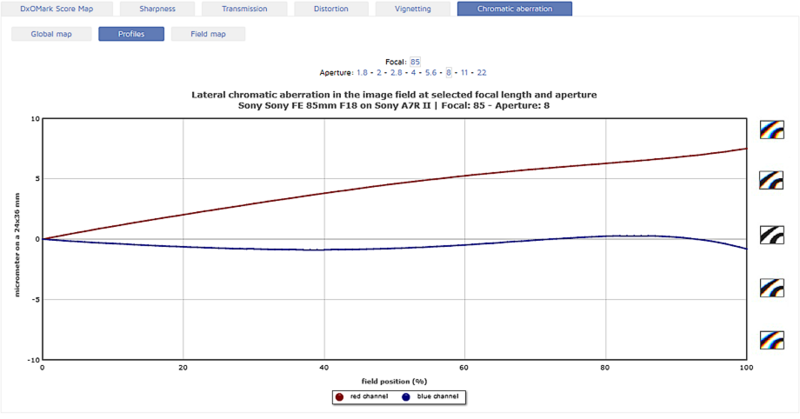 Nevertheless, the new Sony performs well in terms of lower lateral chromatic aberration across the frame, and it continues to perform well when stopped down, particularly with regard to sharpness. It rivals the faster model in the center and outer zones and is even sharper than the Zeiss in the periphery, though by f/4 all three continue to offer similarly high sharpness levels right across the image field. Large high-speed primes such as the 85mm F1.4 G Master are nice to have, but they are pricey, large, and sometimes intimidating. 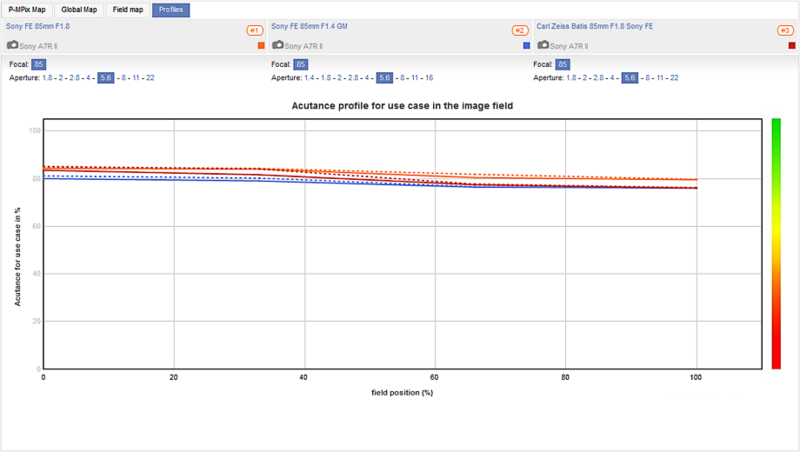 When it comes to moderate-speed lenses, it sometimes seems that manufacturers put price before outright optical performance. That’s not the case here. 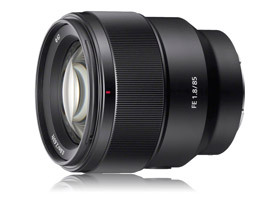 While not exactly cheap, the Sony FE 85mm F1.8 costs less than its premium G Master sibling or even the rival Zeiss Batis 85mm F1.8, yet it has a real nice balance of performance, with excellent sharpness and low lateral color and distortion. Apart from a little vignetting, with its unobtrusive size and low weight, this new lens looks to be an excellent alternative for all the right reasons.